Mix the eggs, oil and milk in a bowl, adding the flour slowly. Knead until the dough gets smooth. After kneading, leave the dough for 20 minutes. Pull off pieces shaped like walnuts and press slightly between your palms. Bore holes at their center. In another pan, heat the oil and fry the donuts. After both sides get fried, take them out of the pan and wait until they get cooler. Melt your chocolate in a double boiler and mix with the liquid cream. 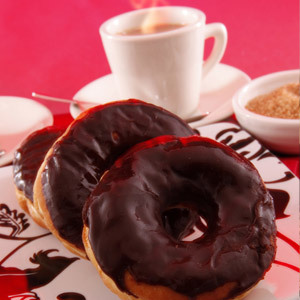 Pour this cream-chocolate mixture on your donuts. You can melt the chocolates separately to prepare different donuts (bitter chocolate donut, white chocolate donut etc. ).